Graduating nursing students are automatically entered to win a complimentary 7-day access to Hurst’s premier online NCELX® review course (must have an AfterCollege account). One (1) graduating nursing student from each school with an AfterCollege Nursing Career Network is chosen to win at random. To be eligible you must be a current student who is majoring in nursing, are graduating this year, and have an AfterCollege account. The complimentary NCLEX review giveaway happens once each semester. Winners are chosen after April 1st (Spring semester) and November 1st (Fall semester). You can view past NCLEX review winners here. 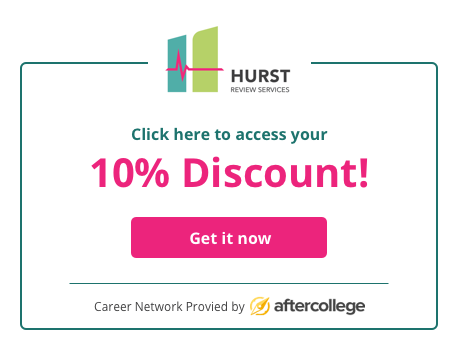 All AfterCollege users are entitled to a 10 percent discount on Hurst Review Services 90-day-online NCLEX review. (2) Reload this page. The link to claim the 10% discount will appear here. - The discount will be applied automatically upon checkout if you are logged into your AfterCollege account. - This discount cannot be used retroactively or refunded if you win a 7-day review.